Train your dog to stop at the sight of a bird flying up from cover instead of chasing it. The QLD Dogtra Launcher allows you to easily adjust for a very quiet launch or to throw birds higher. These launchers are a great tool for helping you train your dog to stop at the sight of a bird flying up from cover instead of chasing it. Dogtra's RR Deluxe electronic remote release system features two sound modes: authentic Mallard duck-call attention getter or a beep-locater sound. 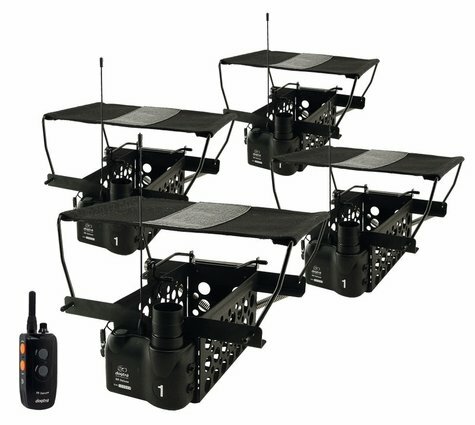 The Dogtra RR Deluxe will run up to eight different receivers off one transmitter, and each receiver can operate two launchers with the use of a 15 foot jumper cord (not included), giving you control of up to a total of 16 launchers! In addition to Dogtra launchers, the Dogtra RR Deluxe is compatible with Thunder Equipment, Zinger Winger, Etch-Marc, and most other after-market bird / bumper launcher systems. The remote release system has 1,000 yard range. The attention-getter sound has a 100 yard range (range may vary with weather conditions). Uses long lasting rechargeable Ni-Mh batteries (charger included) with 3 color battery life indicator. Transmitter is waterproof, and receivers are water resistant. Dogtra QL (for quail) - 8.6" x 4.5" x 4.3"